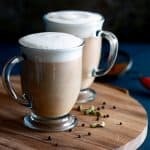 Not only does this Homemade Chai Tea Concentrate make your house smell amazing, but it also makes creating your favorite coffee house drink at home incredibly easy. As much as I try to be a coffee drinker, chai tea continues to be my drink of choice each morning. After dropping off the big kids at school, my two year old sidekick and I usually make the trek to Starbucks. Chai for me, cake pop for her. And then there are days when I just want a chai like five minutes ago and don’t want to make the trip across town to get one. Enter my Homemade Chai Tea Concentrate. My saving grace sitting inside my fridge that means my favorite drink is at the ready. This isn’t my first foray in making my favorite coffee house drinks at home. Many of you love my Iced Caramel Mocha Latte and Iced Cinnamon Almond Milk Macchiato almost as much as I do! 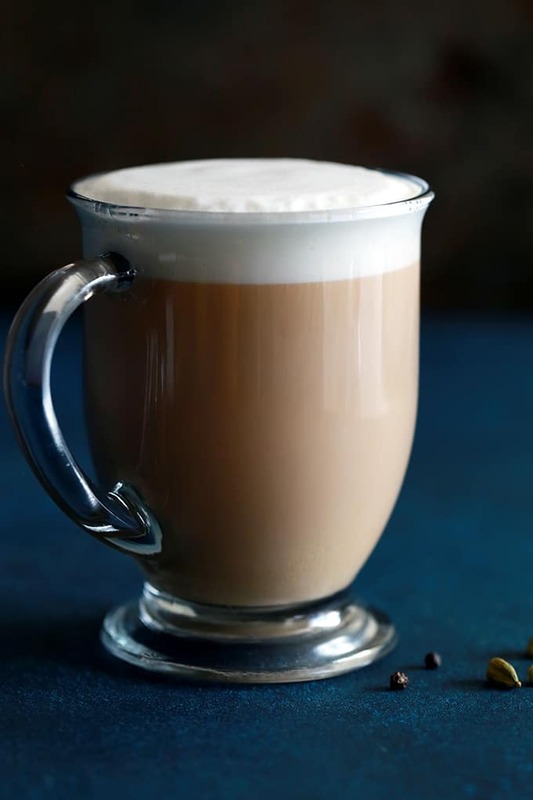 Depending on the season, you can choose how to use my Homemade Chai Tea Concentrate as the base for either a warm or iced drink. They’re both equally delicious! What is chai tea concentrate? I’ve found the actual process of making this Homemade Tea Chai Concentrate totally soothing. It also makes my house smell insanely amazing. It’s hard to believe that simple pantry ingredients come together in under an hour to provide me nearly two weeks worth of chai. Delicious both hot or iced. My perfect pick-me up drink no matter what the weather. Peppercorns, cardamom, cloves and fennel seeds are toasted and then drowned in water. 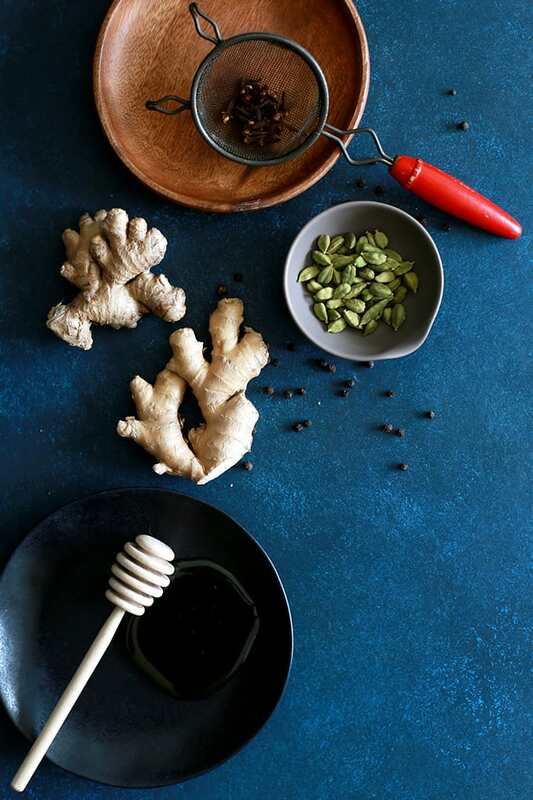 Fresh ginger and black tea then join the fun before everything is then sweetened with honey and vanilla. Although other recipes you might find use loose leaf tea, I create my Homemade Chai Tea Concentrate with tea bags. No measuring needed, no extra mess. I can simply grab a few tea bags from the pantry and go. Proof that when you’re making your own DIY version of a favorite drink, it doesn’t necessarily mean that more work will be involved. The liquid is then strained so that all remains is your very own Homemade Chai Tea Concentrate. I store it in quart sized mason jars in the fridge so it’s easy to pour the amount that I need whenever my chai cravings arise. I love pouring the concentrate directly into a mug and warming it in the microwave before topping it with milk that I’ve warmed in my beloved milk frother. It tastes just like a barista made it, only better as I didn’t have to leave my house. 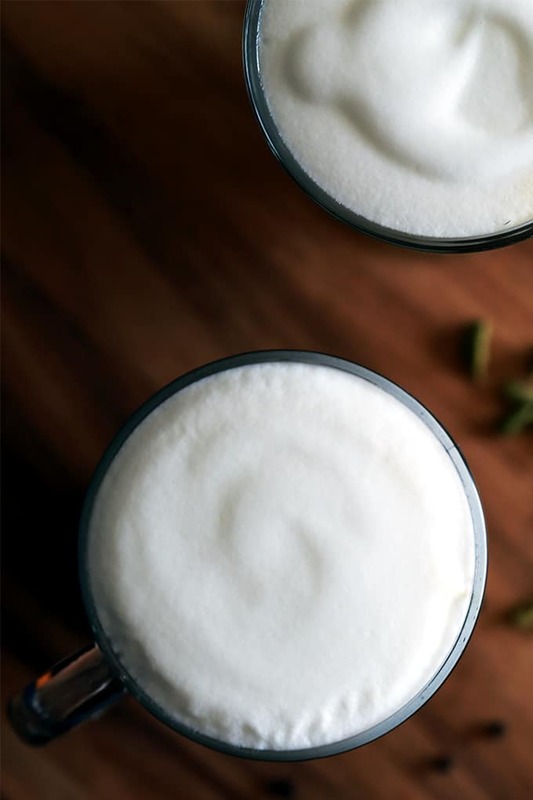 Not only does this Homemade Chai Tea Concentrate make your house smell amazing when you make it, but it also makes creating your favorite coffee house drink at home incredibly easy. Peppercorns, cardamom, cloves and fennel seeds are toasted and then drowned in water. Fresh ginger and black tea then join the fun before everything is then sweetened with honey and vanilla. Roughly chop fennel seeds and add to large saucepan. With the back of a knife, crush peppercorns, cardamom and cloves and add to saucepan. 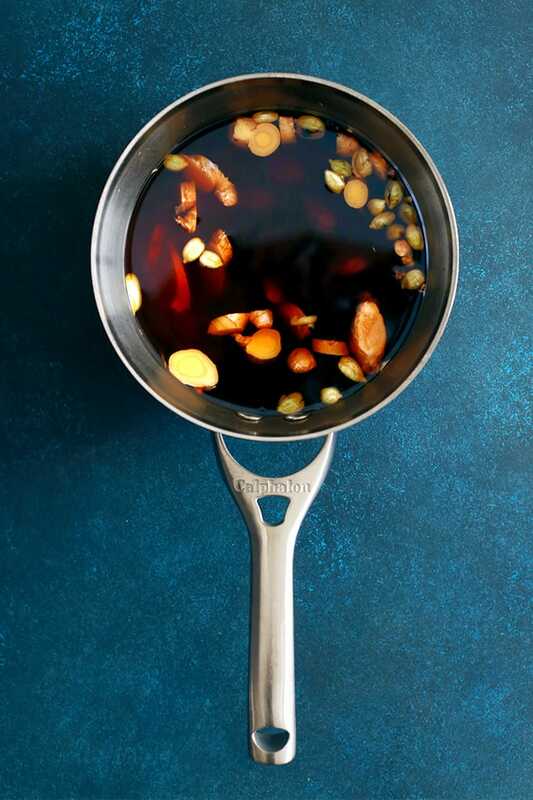 Heat saucepan over medium heat until spices become fragrant, shaking saucepan frequently to avoid burning. Add water and ginger and bring to a boil. Turn off heat and place tea bags in water and spices mixture for five minutes. Remove tea bags, using the back of a spoon to wring water from bags. Stir in honey and vanilla and allow to stand for one hour. Pour mixture through strainer to remove spices. To use concentrate, stir together 1/2 cup milk and 3/4 cup concentrate. Serve either hot or iced. 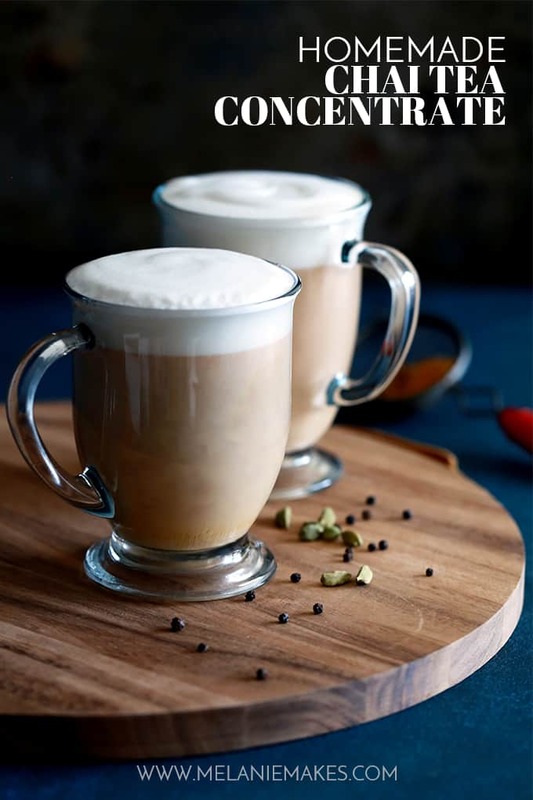 Obviously this Homemade Chai Tea Concentrate is perfect simply mixed with milk, but you could also use it as the base to this Dirty Dirty Chai Latte, Chai Tea Smoothie or Bailey’s Chai. I can’t wait to try them all! i found this recipe not to be strong enough. 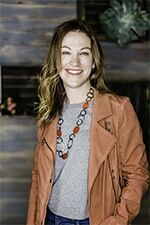 Hi, Katelyn - If you like the concentrate stronger, you definitely could let the tea bags steep longer or simply add more tea bags as well! I need to try this tea! Looks really good! It's my go to every day - love having a stash in the fridge! This is totally going to come in handy for chilly nights :D One of my favs, can't wait to make it at home! Hope you'll give it a try, Chrisy! I love chai tea - making a concentrate is a great idea! Wow I have no idea this could be made! A total game changer, Allyson! My husband definitely love this! I'll make this Chai tea for sure! I think he'd love it, Erin! Chai tea is my favorite hot drink to sip on. Such a fantastic idea! I can't wait to try this! One of my favorite drinks at the local coffee shop. I never thought about making it at home... until now! So nice to be able to DIY it, Dorothy!